ST. LOUIS — Interim head coach Craig Berube’s tenure leading the St. Louis Blues began with the same result that ended the Mike Yeo era — a loss. Filip Forsberg‘s shorthanded breakaway goal in the second period broke a tie and propelled the Nashville Predators to a 4-1 win over the visiting Blues on Wednesday night. It was one of two shorthanded goals the Predators scored against Blues, who are under new management after Yeo was fired after a 2-0 loss to the Los Angeles Kings on Monday. 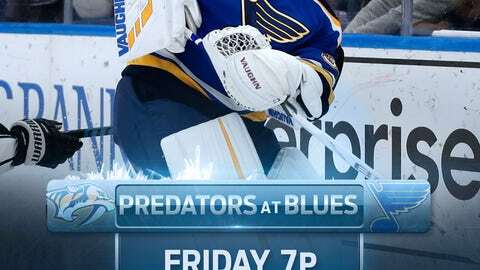 The Predators enter Friday’s rematch on a three-game winning streak. Aside from Forsberg, Nashville got goals from Frederick Gaudreau, Austin Watson and Ryan Ellis on Wednesday. The bigger note was the Pekka Rinne made 28 saves to earn his 320th career victory, passing Miikka Kiprusoff to become the winningest Finnish-born goaltender in NHL history.